Don't you hate it when your housemates nick your stuff?! You can complain as much as you like, but it will never stop! It's an unwritten rule that if your name isn't plastered all over it, it's likely to go missing! When it comes to a shirt, or a DVD it's forgivable because you can easily take them back, but if someone 'borrows' your food or drink there's no hope of getting it back! To help keep the fridge bandits at bay, this special Can Fridge Guard will give anyone a shock as they hear your voice emanating from among the old yogurts and soggy cabbages! Simply think up a decent warning message that will keep others away from your food and drink, then all you have to do is record it into the Novelty Can Fridge Guard! This hilarious little gadget is shaped like a standard drinks can that can blend into any fridge. It's light activated, so whenever someone opens the fridge door, the recorded message will play! Of course, you don't have to use the Novelty Can Fridge Guard to only ward off fridge thieves, you could also record a reminder to someone; perhaps the cat needs feeding, or you need some more milk. 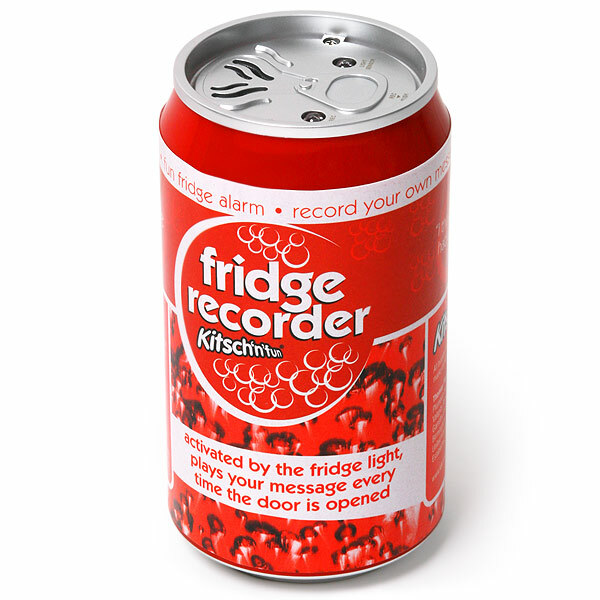 Just record your message and every time you open the fridge door the message will play! "A friend was so delighted when he got this as a wee gift on his birthday, I just had to order some more. Brilliant and good price, many thanks." "What a great, fun and cheap little gadget."